Introduction – ADVOCATES FOR FINE ART ENAMELING INC. The mission of this organization is to increase awareness and appreciation of glass on metal (vitreous enamel) as an art medium . Art has developed in every culture to create expressions of, and reactions to, the human condition. Materials used for art have been selected because they are useful to fashion the message of the artist, and because they can attract the attention of the viewer. Glass on metal certainly has qualities which attract the eye, but it is a medium which also is peculiarly useful for fashioning complex messages about our lives and the state of our environment. For three millennia, glass has been melted on metal to produce both expressive art and decorative art. There are no other materials which can quite duplicate the sheen, texture, color and depth of glass on metal . In addition, glass on metal has a physical permanence which cannot be matched by other art media. It is weather-proof, and the colors do not fade. It will not rot. Yet, in all this time, glass on metal has not been used very much as an art material when compared to other materials. Glass and metal are comparatively expensive, but this is not the chief reason that creating glass on metal art has not achieved great popularity during the three and half millennia of its existence. The main reason is that the materials have to be fused together at a high temperature. An oven and a stable supply of great heat are needed. The enameler needs considerable skill to bake the materials together. 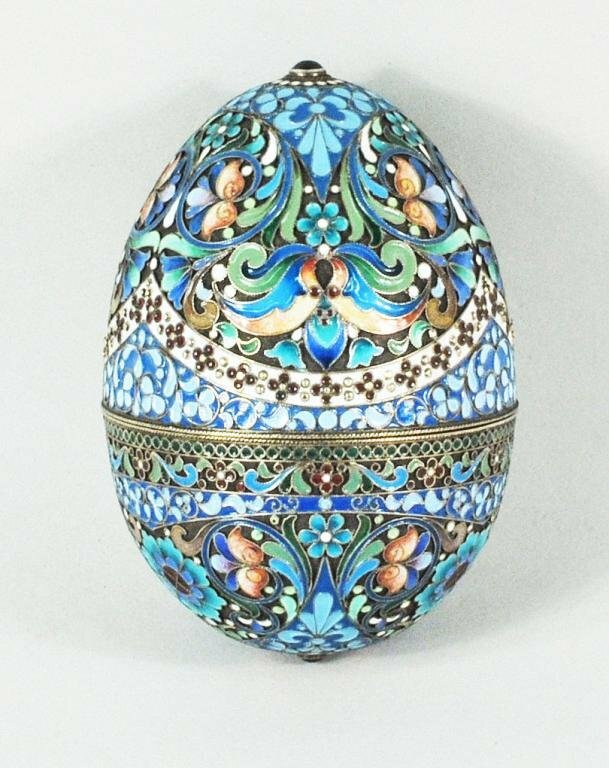 This Faberge egg is a classic of decorative art. The enamel is used as a background color. The work succeeds fabulously in bringing unique beauty to the viewer. Since enameling materials were costly and the process was labor intensive, enameled objects were expensive, and comparatively rare. These factors have led to enamels typically being a part of expensive precious objects. It has a long history of being used in jewelry, religious objects and other decorative arts. The introduction of the electric oven in the 20th century has allowed enameling to be done much more easily. 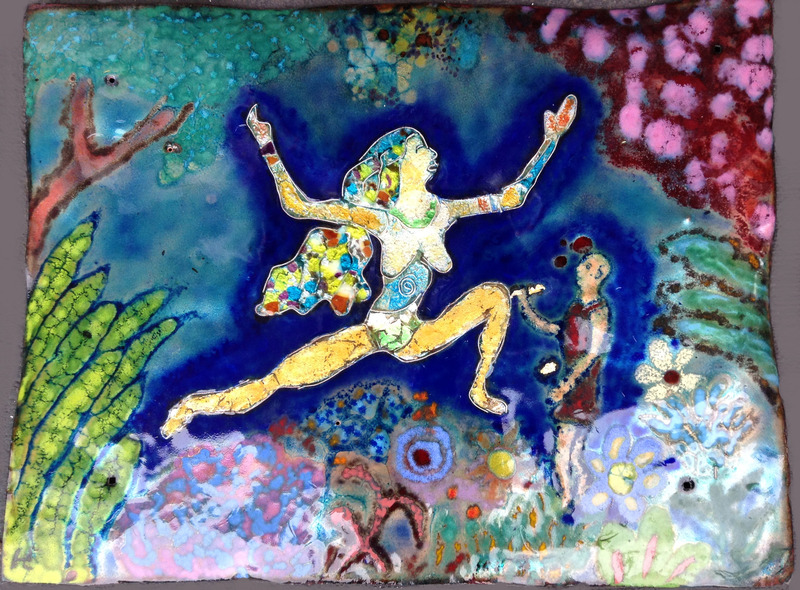 The 20th century has seen some fine art enameled wall pieces and sculptures which were designed to express something about the human condition. Yet, enamel still was more likely to be used by crafts people, jewelers and decorative artists than by expressive artists throughout the century. 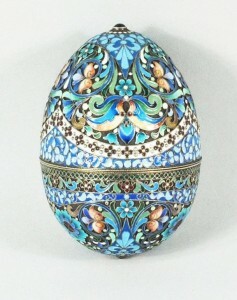 Vitreous enamel, glass on metal, still is thought of primarily as a medium for crafts and decorative art at this time. This wall hanging is an example of expressive art. Pygmalion has finished sculpting Galatea. The statue represents his fantasy woman companion. It is larger than human size. It is jewel-encrusted and gleams and glitters. It dazzles him. No such woman can exist in real life. He wants too much. The enamel in this wall piece is not a background element. It is chosen as the primary medium to convey this message. It is the purpose of this organization to call attention to glass on metal as a medium for expressive art. It is our intention to publicize enamel wall pieces and sculpture which have been created especially to say something about our lives and feelings. We intend to encourage expressive artists to use glass on metal as a medium and help artists who do so get the attention they deserve. We will network with artists, participate in exhibitions and use electronic and print media to publicize glass on metal as a fine art medium.